Most of the signal providers do not have customers, they don't make any income and they go broke fast. But I don’t want you to be one of them, so let me help you there. Watch my FREE video series below and learn how to turn your trading signal service into a real business under your own brand. No opt-in required. There are some crucial changes from 1st February 2019 for Signal Magician. Make a note of them before you watch the videos below as they were filmed before these changes. 1) Lifetime licenses are not available anymore. Click here for new annual plans. 2) We'll do hosting of SM web panel on our web servers. We'll include web hosting in the price. You or your customers will only have to host MT4 terminals to copy your trades. 3) You no longer get the PHP source code of the SM web panel. 4) These do not apply to everyone who has purchased Signal Magician LIFETIME license before 2019-01-30, and they will get a previously valid deal. 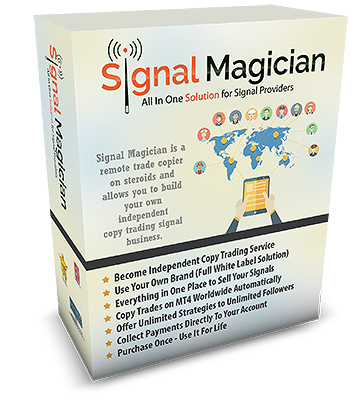 Order "Signal Magician" remote trade copier with web-panel today and start selling trading signals from your website. Manage user access easily through web-panel: Signal Magician comes with a private members area so you can easily manage user access and also see status and trading history of all linked MT4 accounts. Send Your Trading Signals by SMS and Email: Signal Magician allows your clients to receive Email and SMS notification messages (using Twilio) directly to their phones in 200+ countries. Receive payments for subscription directly to your PayPal or ClickBank: Signal Magician integrates with PayPal and ClickBank, which are one of the most popular payment systems. As soon as the payment reaches your account, the Signal Magician will send a welcome email to a new customer with necessary login information to access member area. Multi-language control panel interface: Signal Magician web-panel is available in 9 languages: English, Spanish, German, Chinese, Japanese, Hungarian, Italian, French and Lithuanian. Known when master or client MT4 accounts goes offline: Signal Magician comes with a plugin called EA Status Watch which monitors if Client EA or Server EA are online/offline and notifies users by email. I want SIGNAL MAGICIAN now! Why being an independent trade copier or trading signal service is a much better choice. How to turn your Forex Signal Service into a REAL business. How to control your customer's access to your trading signals and disable their access automatically if they cancel or refund. Live demonstration of how trading positions are copied between MT4 accounts when they are located on different computers anywhere in the world. How to offer lots of strategies for copy trading with individual risk for each client and allow customers choose which ones they want to follow. Learn about MT4 hosting solutions for your customers. How you can start your trade copier and trading signal service with only Signal Magician and MT4 platform. How to set up automated payments with PayPal and ClickBank to get your business running on autopilot. How you can re-sell trades from MQL5 Market, Zulutrade or any other demo/real MT4 account you have access via investor password. How to become an independent Signal Provider or account manager and make a passive income.